We are proud to announce that Natural Calm Cream has been awarded the Taste for Life Essentials Award in the personal care category. 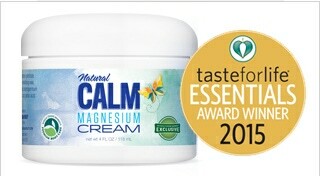 Natural Calm Cream is a transdermal magnesium cream exclusively formulated by leading magnesium researcher Andrea Rosanoff, PhD. The laboratory-tested cream can be applied to any area that is tense, stiff, inflamed or in pain and can be used in lieu of magnesium oil.